See the ARRL 2018 Hurricanes Page for Information Resources, ARRL News, Media Hits, and Donations to Ham Aid. Archives of the ARRL ARES E-Letter back to the original issue (September 2005) are available for download. SKYWARNâ¢ Recognition Day 2018 took place on Saturday, December 1, from 0000 until 2400 UTC. Developed in 1999 by the National Weather Service and ARRL, SRD celebrates the contributions that SKYWARN volunteers make to the NWS mission of protecting life and property. During SKYWARN Recognition Day, many special event stations were on the air from NWS offices, contacting radio amateurs around the world. Stations exchanged call sign, signal report, and location, plus a quick description of the weather at their location. "Amateur Radio operators comprise a large percentage of the SKYWARN volunteers across the country," an NWS announcement said. "Amateur Radio operators also provide vital communication between the NWS and emergency management if normal communications become inoperative." As of mid December 104 log summaries have been received, including summaries from 27 National Weather Service forecast offices. A total of 58 submissions indicated they made contact with the SRD bonus station, WX1AW. The most popular bands, based on log summaries, were 40 meters, 20 meters and 2 meters. The top modes were SSB, FM and Echolink/IRLP. SRD log summaries are due by January 31, 2019 and the log submission form can be found online. and NWS offices as in past years. This was the first year in our new NWS office building in Norton." Macedo said "We utilized our usual operating position but moved HF and one of our Echolink stations into a conference room nearby. It worked well to keep noise level a bit lower on the ops floor and to allow the additional operators we had to operate Echolink/IRLP systems. It was very active this year with continuous operation of NWS offices throughout the entire event. We also made a number of contacts on DMR as well." station operators made 176 QSOs and 23 NWS offices were contacted. The brief weather reports received ranged from 30 degrees F in Minnesota to a balmy 87 degrees in Puerto Rico. 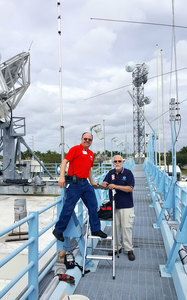 Station Assistant Manager Julio Ripoll, WD4R, said he and John McHugh, K4AG, repaired one of the station's antennas, and noted "It was so moving to watch the flag being lowered to half-staff at the Hurricane Center in honor of President George H.W. Bush." Maxim Memorial Station W1AW was also active as bonus station WX1AW, the call sign of The HQ Doods Recreational Deployment Team. As we close another historic hurricane season, as a tribute to amateurs who provided primary and secondary communications and other services, here is the testimonial of Kenneth Graham, WX4KEG, Director of the National Hurricane Center, from earlier this year: "As the incoming Director of the National Hurricane Center, I want to take a moment to thank you for the important work you do to ensure communications continue during and after a disaster. "In the aftermath of Hurricane Katrina, ham radio was the only remaining method of communication for many of us in the disaster zone. My handheld and the base unit at the New Orleans National Weather Service Office were our only links to the outside world. I cannot stress enough how critical redundant methods of communications are during and after a disaster. As the infrastructure fails, it is you all that keep the two-way dissemination of critical information going. "We at the National Hurricane Center recognize and value the role of WX4NHC and all of the Amateur Radio operators with whom they connect. As we saw during last year's extremely busy hurricane season, the next hurricane to impact our area is always just around the corner. After experiencing the aftermath of Hurricane Katrina, I can tell you we cannot do without WX4NHC to ensure we can continue to perform our mission responsibilities. Lucas County (Ohio) ARES is active and involved with the county's EMA, and provides communications for events such as the Glass City Marathon and the Sylvania Triathlon. ARES also supports the Northwest Ohio Healthcare Emergency Management Coalition (NWO-HEMC), which covers 18 counties. They recognize ARES as a viable tool and have included Amateur Radio in their communications plan. Lucas County ARES also has a long term relationship with the eight local area hospitals and regularly performs communication drills using the hospitals' radio equipment. The equipment is located in a variety of areas each assigned by the individual hospital. The equipment list at the hospital stations is extensive and includes a complete D-Star capable station minus the computer stored in a box on the wall. It is up to the operator to find a place to set up the station within reach of the antenna lead attached to the wall. not stable. The noise in the room was loud and the operator required earphones to monitor the radio. Bellner said he had to move the station to afford the room to extend the Incident Command table area. He came to realize that during a drill or other event there may not be any chair or table at all to operate from. As a result, Bellner came up with the idea of using a rolling, movable station based on the Computers On Wheels (COWs) used on the hospital patient floors and units. The nurses use them to go room to room; they are easily maneuvered. The battery is located in the bottom of the COW and gives it ballast. They also have a relatively small footprint. Bellner adapted the COW idea as a portable station to be used as a "grab and go." 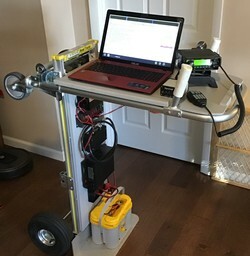 A Milwaukee hand cart serves as the framework skeleton and his Amateur Radio On Wheels (dubbed AROW) is incorporated into Bellner's home ham shack so it is always ready to go. In the October issue, John Bloodgood, KD0SFY, Emergency Coordinator and Public Information Officer for Region 2 District 2, Colorado ARES (Pikes Peak ARES) wrote that more vehicles have non-steel roof panels constructed of fiberglass, aluminum, or carbon fiber, and this makes placing a temporary mag-mount antenna on the roof difficult. Bloodgood said "We have run into this issue several times in the past when our radio operators were riding in Support And Gear (SAG), sweep, or pace vehicles during special events or riding along with a Jeep Patrol in the mountains. Recently, I was assisting a neighboring ARES region with a special event and was riding in a new law enforcement vehicle that had an aluminum roof panel.The solution was to use an HT Window Mount Clip from MFJ (MFJ-310). They make a BNC, SMA, and female SMA version of this clip so you can easily attach an HT antenna and get it outside of the vehicle. It is small enough to throw in a ruck sack if you know you will be operating from a vehicle other than your own. It may not have the same ground plane effects of a mag-mount, but it definitely works." So, I bought one with the BNC connector and tried it on my new Honda Fit. I don't know if my new car's roof is steel or not, but I liked the idea in any case of not scratching the new roof with a mag-mount. I had very good results with mine and would recommend it. It's inexpensive, about $20, and I'm thinking about getting another one with the SMA connector so I can use my DMR hand-held. It's very easy to slip over the top of the car window, and is held firmly in place when the window is rolled up. The small diameter cable (10 ft. flexible mini RG-58 coax) runs in a slot on the top of the clip, so it is not impinged upon by the window frame. Over the years, especially since Hurricane Katrina (2005), I've seen a more proactive and robust response to hurricanes and other major disasters, but I never truly grasped its scale until now. As I was browsing through my emails, I found a summary report from FEMA that captivated my attention. Hurricane Michael made landfall west of my home in the rural Suwannee River basin in Florida; since the warning area had included the Suwannee River, I evacuated to the central east coast of the peninsula. Following the devastating storm, I was amazed to read of the massive response from the "whole community," FEMA's term for everybody from federal, state, county and local governments and the military, to NGO's, faith-based organizations, American Red Cross, and including organizations like ours, the ARRL and ARES. More than 16,000 federal employees, including over 8,000 military personnel were deployed. Search and rescue teams from FEMA, the US Coast Guard, National Guard and others, working alongside state responders and volunteers, completed 110 evacuations, 4,193 rescues/assists, 15,287 shelter in place checks, and 128 animal assists. Structural assessments were completed on 16,827 structures in Florida. Sixteen different states sent support through the Emergency Management Assistance Compact with more than 430 deployed to assist. More than 35,000 utility workers from 26 states worked to restore power. In Florida, FEMA provided 715,000 meals and 1.5 million liters of water per day. FEMA transferred more than 350,000 meals to Georgia for feeding operations. The feds supported more than 30 distribution sites. More than 1,600 people stayed overnight in American Red Cross shelters in Florida and Georgia. Shelter residents were able to use the Red Cross's Safe and Well site to check in and find missing individuals. The US Department of Defense put 5,000 personnel in the field with assets including 32 helicopters, six fixed wing aircraft, 17 swift water vehicles and 160 high water vehicles to support search and rescue missions. More than 4,000 National Guard troops in Florida and Georgia were assigned to over 50 missions that included search and rescue, engineering, route clearance and points of distribution support at 30 locations. Troops also provided support at 12 shelter locations. A Guard heavy engineering unit cleared 107 city blocks in the affected area. US Coast Guard working with US Customs and Border Patrol, completed 355 assists/rescues and one animal rescue in Florida. Three USCG Damage Assessment Teams and two Reconstruction Teams were assessing and repairing damaged facilities. The US Army Corps of Engineers fielded seven response programs including providing temporary emergency power in Florida, offering technical assistance on debris removal, route clearance and temporary roofing. Twenty route clearance teams cleared roads in Florida. Two Deployable Tactical Operations System Vehicles assisted with communication capabilities and connectivity. The Corps monitored and managed dams. Eight Health and Human Services Disaster Medical Assistance Teams cared for patients at four emergency departments in Florida. The FCC provided emergency assistance to communications providers and created a web page for information and tips for communicating during an emergency. The US Department of Interior had 225 personnel conducting debris clearance and infrastructure damage assessments. The Salvation Army mobilized 48 mobile feeding units with a combined service capacity of 72,000 daily meals. Operation BBQ Relief had field kitchens in Florida with a total meal capacity of 30,000 meals per day. The Southern Baptist Disaster Relief opened disaster kitchens for 60,000 meals per day. The list goes on, but you get the idea. There were a couple of takeaways for me: First, was the sheer massiveness of the whole community response, so much greater by orders of magnitude from the pre-Katrina era. And second, it occurred to me that there is still an almost unlimited array of new opportunities for radio amateurs to contribute supporting radio communications to many if not all of the entities and services described above and almost countless others. Back in the nineties, there was concern expressed by the field that ARES and other amateur emergency services were facing diminishing demand and new opportunities to provide their radio communications support due to agencies developing and hardening their own communications systems, leaving us outside looking in. To address these concerns and gather input, I held a number of conferences around the country in connection with major conventions and hamfests. The result was a QST report published in the February 1999 issue, pp. 80-81, ARES Providers, Served Agency Reps Together in Tampa, that described non-traditional opportunities for us as ARES members. It seems to me that nothing has changed: Many more opportunities to serve can be found right in the first part of this editorial. Free of charge to ARRL members: Subscribe to the ARES E-Letter (monthly public service and emergency communications news), theARRL Contest Update (bi-weekly contest newsletter), Division and Section news alerts -- and much more! ARRL offers a wide array of products to enhance your enjoyment of Amateur Radio.